Hello December you beautiful thing you. The Christmas wreath is already hung, the day off work is booked to get the Christmas tree and the Christmas jumpers have already made an appearance. As for my Christmas shopping, well. This year will be my first Christmas in my new home and I honestly couldn’t be anymore excited about it. Last year was really stressful as I was going through the house buying process and every bit of spare cash was being squirrelled away for my house deposit. I feel like this year I get to start making my own traditions as well as enjoying it without any guilt. I love this time of the year as everyone just seems happier. As soon as Mariah Carey comes blasting on the radio you can’t seem to stop yourself smiling. Oh, and that one more mince pie, yeah don’t worry about that, because it’s Christmas. ‘It’s Christmas’ is the best kind of excuse for anything. Totally justifiable too when you’re delving your hand back into the tub of roses. So what is it that makes Christmas for me? We all love Christmas. The food, the films, the weather, the presents. But underneath all of that, what does it ‘really mean’? Not only is it the best time of the year for a reason, it marks that one time of the year that I know I will get to spend quality time with my family. No stresses, no thoughts about work and no having to go out and do anything. I value this time so much now that I have moved out and it’s making me more excited for Christmas than ever before. A few days of not having to adult and be looked after? Yes please. But it’s the traditions that come with that. The traditions we have had from growing up and the traditions that I will continue to create each year. We still put a glass of sherry and a mince pie out on Christmas Eve when I go to bed. My sister and I still leave our sacks out. We watch a Christmas film after our Christmas dinner. We always get Hotel Chocolat Christmas crackers. We always go for a walk on Boxing Day morning to walk off the food, ready to get started again when we get home. It’s the traditions that bind it for me and it’s what I look forward to SO much. There’s no other time of the year to look forward to so much stuff for a whole month. It brings happiness and warmth into my life for those few short weeks in December. I love it. As this is my first year in my new home, I’m going all out. I’m getting my first ever real Christmas tree, I’ve bought The White Company decorations for my tree, £20 for a pack of 6 baubles. lol. life. I’m going to spend a few days watching Christmas films and wrapping. I’m also going to head to a Christmas carol service with mince pies. I have to look the part too for all the festivities. I’ll add a new Christmas jumper to my wardrobe every year. I’ll soon have enough for every day in December. Nothing helps me get into the festive spirit more than Christmas Jumpers. 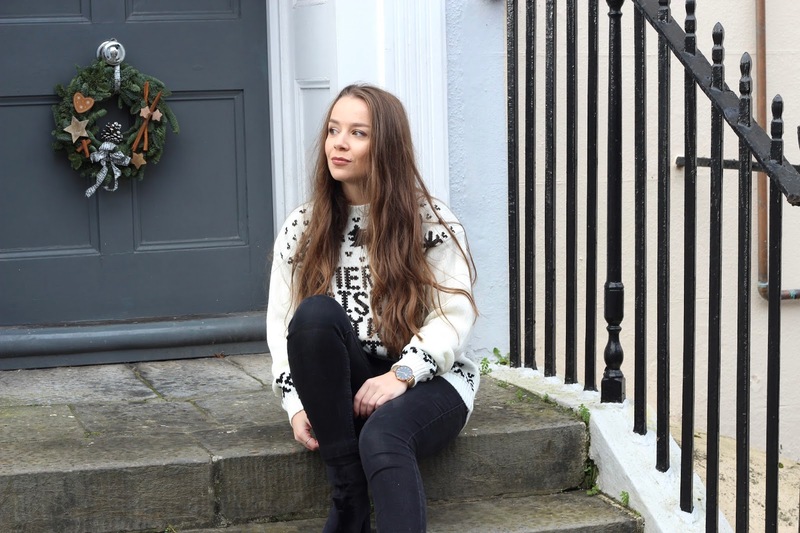 This year Boohoo are collaborating with Teenage Cancer Trust through 4 of their Christmas jumper designs (including the one I’m wearing). From the 4th, for each jumper that is sold they will be donating £5 to the Teenage Cancer Trust. So you can do good by kitting yourself out in your new jumper this year, and help someone else feel good during the festive period too. It’s a win, win! So in a nutshell, it’s the family time and those precious traditions that makes Christmas for me. I’m sure as I get older the traditions will expand and evolve, and I’m just so excited for Christmas this year in my new home. Ya know, just in case you hadn’t noticed I’d already mentioned that 16589 times. I’m sure it’s something that will always make me feel warm and special when I look back on it in years to come.